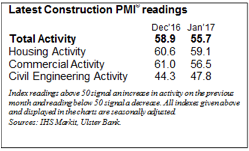 According to the Ulster Bank PMI January 2017, Irish construction activity continued to grow sharply in January 2017 on the back of higher new orders. The key highlight from the latest Ulster Bank Construction Purchasing Managers Index survey (PMI) was a near-record rise in employment as companies responded to greater workloads. On the price front, the rate of input cost inflation quickened to the sharpest since February 2007. The PMI – a seasonally adjusted index designed to track changes in total construction activity – posted 55.7 in January to signal a further marked monthly increase. That said, down from 58.9 in the previous month, the index signaled a slower pace of expansion for the third month running. 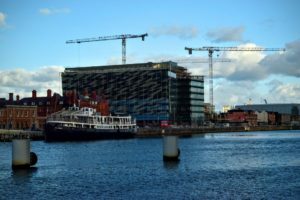 Commenting on the survey, Simon Barry, Chief Economist Republic of Ireland at Ulster Bank, noted: “Irish construction activity continues to grow at a healthy pace according to the latest results of the Ulster Bank Construction PMI. The headline PMI index remained comfortably in expansion territory in January, albeit that the pace of growth eased for the third month running consistent with a modest loss of momentum early in 2017 after a robust end to last year. Very encouragingly, residential activity remains a particular bright spot with Housing activity continuing to rise at a rapid pace, while Commercial activity also very much remains in expansion mode, though the pace of growth has eased in recent months. Civil Engineering continues to lag behind the other sectors, with respondents reporting a third consecutive monthly decline in activity. The rise in total activity continued to reflect growth in both the commercial and housing categories. The stronger rise at the start of the year was recorded on housing projects. Meanwhile, civil engineering activity continued to fall, extending the current sequence of decline to three months. Similar to the picture for activity, new orders rose at a sharp, but reduced pace in January. Where new business increased, this was linked to improving client demand amid stronger confidence. Rising workloads drove a further increase in employment at the start of the year. Furthermore, the rate of job creation was the second-fastest in the survey’s history, just behind the record seen in November 2004. Approximately 27% of respondents signalled a rise in staffing levels during the month. Companies also increased their purchasing activity sharply again at the start of the year, largely reflecting higher new orders. This was despite the rate of growth easing from December to the slowest since last June. Increased demand for inputs contributed to another lengthening of suppliers’ delivery times, although the rate of deterioration in vendor performance was the weakest in four months. There was further evidence of mounting cost pressures in the sector during January, with the rate of input cost inflation quickening to the fastest since February 2007. According to respondents, higher prices for oil-related products and rising costs for items from UK suppliers had been behind the latest increase. Construction firms remained strongly optimistic that activity would increase over the coming 12 months, with close to 60% of panelists forecasting an expansion. 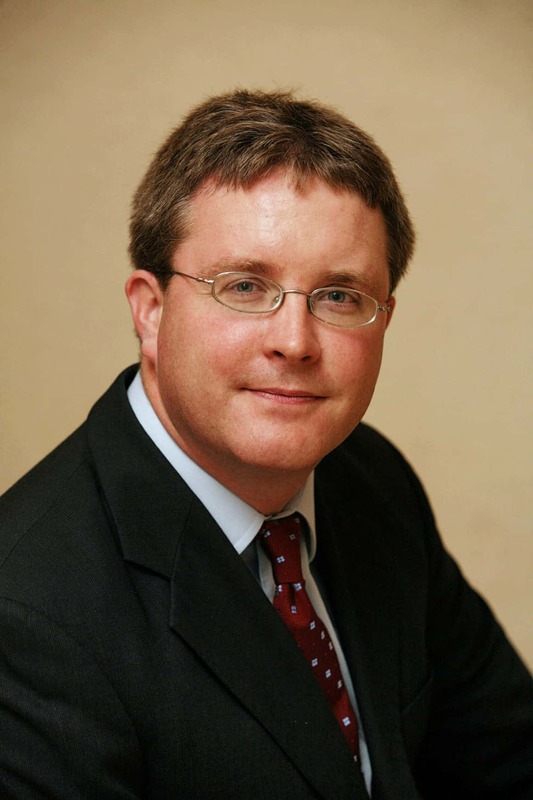 Positive sentiment was linked to confidence in the wider Irish economy and predictions of future new order growth.